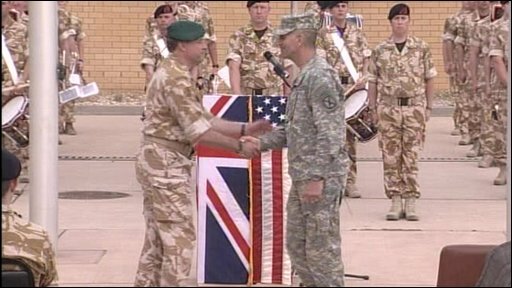 British forces have begun their official withdrawal from Iraq after the UK's commander in the south of the country handed over to a US general. Major General Andy Salmon has transferred authority for what will become Multi-National Division South to US Major General Michael Oates. The generals' pennants were raised and lowered in a handover ceremony. Most of Britain's 4,000 troops will leave by 31 May, the official end-of-combat date. About 400 will stay after that, either in HQ roles or to train the Iraqi Navy. A Royal Marine band from Plymouth played as the Marines' flag was lowered in the ceremony at Basra airbase and replaced with the standard of the US Army's 10th Mountain Division. Britain's Maj Gen Andy Salmon then shook hands with his American successor and embraced him. In a speech at the handover ceremony, Air Chief Marshal Sir Jock Stirrup, the Chief of Defence Staff, paid tribute to the troops who had served in Iraq. "This occasion is about the countless numbers of young men and women from the far flung corners of the US and and the various reaches of the British Isles, who have together striven here with such dedication, with such commitment, and such courage, over so long a period," he said. "We remember particularly at such a time those who paid the ultimate price in this endeavour, those who suffered injury and disablement, in order that we might get to this point today." Since the 2003 invasion, 179 British personnel have lost their lives in Iraq. The head of coalition forces in Iraq, US General Ray Odierno, expressed his gratitude to British forces and public in a speech. "I am grateful not only for the outstanding accomplishments of the brave troopers of the UK, but for the courage and selfless dedication of all the UK forces who served in Iraq, and for the unwavering commitment of the British people in the cause of liberty around the world." Before he took formal control, Maj-Gen Oates said the US "gladly" accepted the responsibility. "The citizens, elected government and security forces of Basra can expect our full co-operation and support. We look forward to the opportunities of service to the Iraqi people, and forging our new relationships here in Basra," he said. Maj Gen Salmon says much has been achieved over the past six years. He told BBC Radio 4's Today programme that the work of British forces had changed the lives of ordinary Iraqis. "For those who are old enough to realise, and compare it with the past gloom of Saddam's era, they look back to 30 years ago and say 'We're seeing stability that we haven't had before; we're seeing levels of freedom that we haven't had before'," he said. "We trust the Iraqi security forces. We can see economic investment start to take hold. We just had safe and secure free fair and an open set elections which have now been ratified and we now look to the future with considerable amounts of optimism." The US role in southern Iraq will be slightly different, focusing more on training the Iraqi police, and keeping open the supply route between the south and Baghdad. The BBC's defence correspondent Caroline Wyatt says US soldiers are now a visible presence in Basra, with British troops handing over many of the buildings and duties at the camp as they pack up after six years in Iraq. But Lt Colonel AJ Johnson, the American taking over the job of liaising with the Iraqi Army at Basra Operations Centre, says there will not be much difference in the US approach in Basra - which means ensuring the Iraqi Army and police remain the most visible presence on the streets. Lt Col Johnson told the BBC: "The bottom line, the aim of the transition itself is to make sure it's seamless and that there's generally no perception that the US army is here and they are going to do things different than the British did when they were here." The Americans are also reducing their numbers, with two brigades due to leave the province of Al-Anbar, once the heartland of Al-Qaeda in Iraq. However, the bulk of US troops are not due to leave until the end of 2011. Maj Gen Salmon said he did not regret that the British forces were leaving Basra before a credible police force was working in the city. "I don't think I have got any regrets over that; it's just the way it is. With the forces we have had and the resources we have had, we have concentrated on training the army," he said. "We've trained the 10th division and trained the 14th division. The 10th division has performed really well further north and the 14th division has performed brilliantly over the last year in Basra, so we've got something to be very proud of."